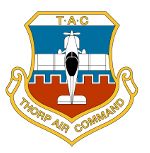 Thorp Air Command - T18.net • View topic - How did I ever live without aileron trim? How did I ever live without aileron trim? Post subject: How did I ever live without aileron trim? I finally broke down and got brave enough to take off my aileron and cut up a perfectly good aileron......and I am so glad I did. I installed aileron trim based off Jeff Blanton's, Lee Walton's and Rich Brazell's photos and write ups. I used the Ray Allen servo that was suggested. I particularly appreciated Jeff's photos because they were so close up!. Man, I love it already after one flight! Here is a link to Jeff's excellent photos. Post subject: Re: How did I ever live without aileron trim? Nice! I have found on both my T-18 and S-18 wing that a tab the size of a dollar bill (or hundred dollar bill U.S.) with 1/2" throws will do the trick. I found by experience that it goes on the left wing so you can see it out the window without bugging your passenger.